Eight teenage boys and a 19-year-old man have been arrested in connection with a fatal stabbing at Victoria. 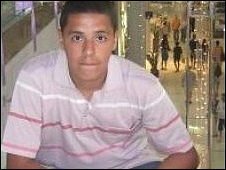 Sofyen Belamouadden, 15, of Acton, west London, died after being chased into the station on 25 March. Two 15-year-olds, two 17-year-olds, four 16-year-olds and one 19-year-old - all from Hammersmith - were arrested. They were all questioned on suspicion of violent disorder and grievous bodily harm before being bailed, pending further inquiries. A further 13 students, all from south London, have appeared in court charged with murdering Sofyen. Among them was Victoria Bukky Osoteku, 18, who appeared at Croydon Magistrates' Court earlier this month charged with the teenager's murder. She and 10 youths aged between 16 and 17 have been remanded in custody to appear in court again at a later date.